Hard luck to our AFL 1 team who narrowly lost to St. Oliver Plunkett ER on the opening day of the league. Despite conceding 2 goals against the run of play in the first half Maurs went in level at half time scoring 5 unanswered points before the interval. The game ebbed and flowed in the second half and Maurs were unfortunate not to score a goal with Conor mc Guire hitting the upright on the 45 minute mark before hitting a screamer of a goal shortly after. Conditions didn’t allow for free flowing football and Maurs were denied a share of the spoils when Ciaran Reddin’s last minute shot was saved at point blank range by the Plunketts keeper. Some solid performances from Seamus and Finbar Harford in defence and Mc Guire and Archer up front. St Maurs 2nd team had a difficult challenge against lucan with them having been relegated from Afl4 the previous year & hoping to bounce back straight away. 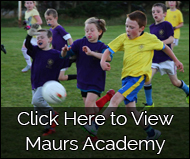 Although St. Maurs out-scored Lucan by 8 scores to 6, 2 goals from lucan put the game out of reach with a final score of Maurs 0-8, Lucan 2-4. There were strong performances throughout the team, in particular from Michael Lyons, Luke Hosford, Chris Moore & Collie Halpin. The 2nd team are looking forward to the challenges ahead & getting back to competitive form. Roll on Templeogue on March 4th. 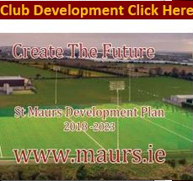 St Maurs 3rd team had a poor start to the season losing 1 - 4 to 0 - 16 to Raheny. Although Maurs had our fair share of possession, we were unable to convert it into scoring opportunities where as Raheny picked off points with ease & maximised their scoring chances. Well done to Richie Lawson, Alberto Perez, Paddy Carrick & Sean Donnelly for strong performances. With stronger opposition in the group to come, match fitness & improving quality will be key to achieving our goal of winning at least 50% of games this season. The Under 14’s took on Man O War in a friendly on a very damp Sunday morning under the Country Crest Wind Turbine. The full squad got a rotation showing our strength in depth and the girls led from the beginning showing no sign of letting the opposition back into the game. Hopefully a ruthless streak that continues into the league campaign which starts next week.